Yesterday, I finished reading Mockingjay, the final book in The Hunger Games trilogy. These are new fiction books that have become very popular in the past few years. In fact, the first book has already been made into a movie. The series portrays a distopian society in which violence and bloodshed are used by the government to keep the population controlled and obedient. The books tend to be fairly graphic, especially later in the series, so I suggest that you use sensitivity and discernment when choosing to read The Hunger Games. The above image is part of a photograph of the old “tabernacle” meeting house on the Church of God campgrounds in Anderson, Indiana. The building hosted multiple worship services every day at the Church of God’s annual week-long campmeeting. Over 5,000 people packed into the tabernacle to worship together and to hear preachers from around the movement. And where everyone could see them, banners printed with various scriptural phrases were hung around the building. One of these, which you see here, was printed with a quote from 1 Thessalonians 5:23 (KJV): “And the very God of peace sanctify you wholly.” Notice how the words “God of peace” are much more prominent than the other words on the banner. As followers of Christ, we are to be in the business of bringing about peace in our world. We serve the God of peace – even Jesus the Messiah, who is the Prince of Peace (Isaiah 9:6). We strive for peace between God and us, a peace that comes from the God who forgives our sins. We strive for peace between human beings, among family members, and in neighborhoods, because we value human life and understand that God (who is love) calls us to love him wholeheartedly and to love our neighbors as ourselves. We strive for peace among people groups and nations so that the kingdom of God, which the angels heralded as “peace on earth” at the birth of Jesus (Luke 2:14), might grow throughout the world. What The Hunger Games lacks is an understanding that peace is only available through reconciliation with God. Katniss Everdeen ultimately desires peace but must live in a world of violence. 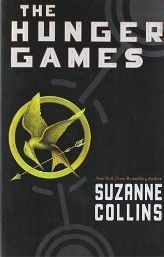 If you are interested, check out a copy of The Hunger Games (that’s the title of the first book) and listen carefully for its cry for peace in the real world.